In the wake of the UN Security Council face-off with Russia and China, a new dangerous phase of the war on Syria is unfolding. The Obama administration, in liaison with London, Paris, Tel Aviv and NATO headquarters in Brussels, is mulling over various military “intervention options”, including the conduct of both naval and air operations in support of “opposition” rebel forces on the ground. The dubious justification for waging a “humanitarian war” on Syria hinges upon the West’s “Responsibility to Protect” (R2P) the Syrian people against their own government, which allegedly is involved in the routine killing of civilians. Meanwhile, Moscow has accused the US led coalition of supporting the terrorist attacks committed by the “Free Syrian Army” (FSA) and Al Qaeda affiliated entities operating inside Syria. It is important at this historical juncture to set the record straight as to who is behind these atrocities and crimes against humanity, particularly in view of the fact that the Obama administration and its allies are contemplating outright military intervention against Syria on “humanitarian grounds”. Who is behind the Atrocities? Whereas the government bears a burden of responsibility pertaining to the conduct of its military operations in urban areas directed against the rebels, the gruesome human rights record of the US-NATO supported “Free Syrian Army” (FSA) is unequivocal. Amply documented, the killings of innocent civilians were not carried by the government but, quite deliberately, by the Free Syrian Army (FSA). The substance of Russia’s finger pointing is confirmed by numerous reports. The Arab League Observer mission report was subsequently shelved because it revealed the forbidden truth, namely that the US-NATO sponsored “rebels” rather than the government were behind the massacres. Russian journalist Marat Musin in a comprehensive report dispels the lies and fabrications of the Western media. The recently released “Intelligence Estimates” of Germany’s Bundes Nachrichtendienst (BND) states that “‘around 90 [terror attacks] can be attributed to organizations that are close to al-Qaeda or jihadist groups’ (January through June 2012) as reported by the German daily Die Frankfurter Allgemeine Zeitung (FAZ)”. (quoted in English by John Rosenthal, German intelligence: al-Qaeda all over Syria The Asian Times, July 24, 2012). The above mainstream media reports –together with an extensive body of evidence contained in independent alternative media reports– confirm unequivocally that crimes against humanity are being committed by terrorist militia. We are at a very dangerous crossroads. An all out “humanitarian war” against Syria is on the drawing board of the Pentagon, which, if carried out, could lead the World into a regional war extending from the Eastern Mediterranean to the heartland of Central Asia. It is essential to reverse the tide of war propaganda which uses civilian deaths as a pretext to wage war on humanitarian grounds, when those killings of civilians were carried out not by government forces but by professional terrorists operating under the helm of the US-NATO sponsored Free Syrian Army (FSA). 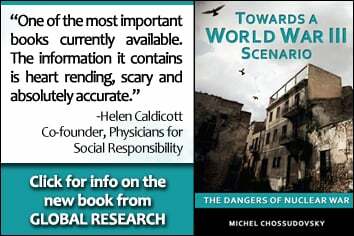 For further detailed documentation on Who is behind the Atrocities in Syria see Michel Chossudovsky (Editor), SYRIA: NATO’s Next “Humanitarian” War? ONLINE INTERACTIVE I-BOOK, Global Research, February 2012, updated June 15, 2012, PART VI of this Collection pertains to War Propaganda and The Massacre of Innocent Civilians.